KCET Application Form 2019: Karnataka Examination Authority (KEA) will announce the notification for Karnataka Common Entrance Test in the month of January. Candidates who want to pursue their career in the field of Engineering, Pharmacy, Agriculture and various other courses can apply for Karnataka CET Application Form. It will be available in online mode. KCET 2019 is an entrance test held at state level for those students who are interested to take admission in the first year of engineering, agriculture, pharmacy & other courses provided by KEA. Candidates can check KEA CET Eligibility Criteria before applying for the entrance test. The criteria will be prescribed by KEA official authority and will be different for various courses. 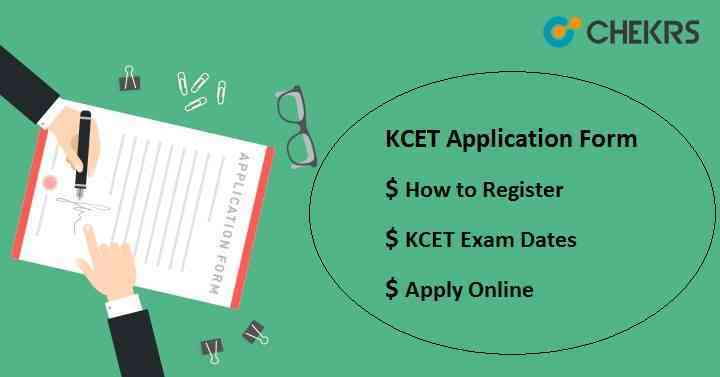 Only Indian/ Overseas citizen of India can apply for KCET 2019. Candidates must pass 12th from any recognized board of Karnataka state/ Karnataka board. Applicants must have scored minimum 45% aggregate in marks in Physics, Chemistry & Mathematics together. English subject is mandatory in the qualifying examination. Note: To know detail information about Karnataka CET 2019 Eligibility Criteria, Check here. Visit the Official site kea.kar.nic.in. Click on “New User? Click Here to Register” link available on the home page of portal. Fill the all details asked in the registration form and then click on “submit” button. User ID will be created after registration and will send on the candidates mobile no or mail id. Enter User ID, Password & Security code and click on “Login” button. Fill the application form with the details information like Personal Details, Examination Details, Address etc and then click on “Save & Next” button. Next step is to upload the images such as photograph, signature & left-hand thumb impression. Photograph must be in passport size with white background and uploaded only in jpg/jpeg format. After uploading images, read the declaration and click on the “I Agree” checkbox. Click on “Submit” button and move to payment page. Fee can be paid through the challan of SBI Mysore, SBI Hyderabad, Indian Bank, Axis Bank & SBI Bank. Select the bank according to your convenience, download the challan form and then submit the fee at the respective bank. After test fee submission, candidates can download the application form. Take the print of filled application form by clicking on “Print Final Application” for future use.